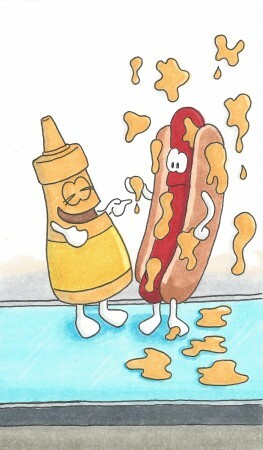 Fact: mustard is a jerk. I’ve never known one greater. and called a hot dog “weenie”. and then it punched the juices. to stop that fruit’s abuses. to stop the lemon’s raving. pounced piles of pancakes flatter. gave shish kebabs a sticking. that it will go un-tasted. by rancid of rank tomatoes. a mash of the potatoes. made all my kitchen grimy. the floors were soiled and slimy. Previous Previous post: 1491 – Bingo!